Took my best girl to my best restaurant for Valentines Day. There is something grand about being very comfortable in a room as nice as Cru's, with a staff as talented as the one at Cru. Cru has become one of our "occasion" restaurants and the fact that it manages to stay so special, in spite of my being there quite a bit, is a testament to how well its team executes their mission. At its size, the wine list at Cru could never get in a rut, it couldn't even get in a furrow, which must present a challenge to Shea and the kitchen (one which, I am happy to say, they have risen to for more than two years now). I am aware there are people out there that view the ambiance of Cru as Old Boy and thus find it a little off-putting, but that has never been my feeling. If you could have seen Wife in black satin, nestled into the chocolate-colored velvet of the banquette at one of the tables for two brought in specially for Valentine's Day, you would find it hard to imagine Old Boys, too. The room is warm, sedate and confident and, with all the deep brown, round wood, it feels somehow like a fantasy spot in an old forest made for eating and drinking fine food and wine. We started it all off with a glass of Billecart Salmon NV Rose with Robert, the sommelier's, compliments. I guess it is a no brainer, but Valentine's Day and a glass of pink bubbles was of course a perfect coupling. Minerals, shrimp shells, and strawberry on the nose, the persistent action of the bead did a nice warm-up job on the palate. 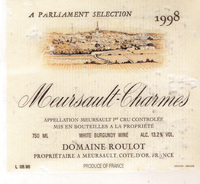 For dinner, I chose a '98 Meursault-Charmes by Roulot to carry us the rest of the way. Alex suggested, and we agreed, that being a little more mineral-driven then the typical Meursault it would play well through all the courses. It was almost Chablis-like in its minerality, like a jagged stone had been well polished then softened with notes of wood, lemon, herbs, and pears. First out from the kitchen was a carrot chip cone with whipped goat cheese. Crisp when bitten, the chip softened to a kind of carrot leather which sweetened the piquant-ness inherent to the goat cheese. Next up was a trio of amuses: an aranchini, a mini Cuban sandwich, and a tart shell filled with truffled robiola and a pine nut. The robiola tart is awesome, when I pop into Cru for a drink and they ask if I would like anything to eat, without fail I ask for a platter of these (so far, no luck, but I'll keep trying). The first official course was Bigeye Tuna Tartare with Red Shiso and Pumpkin Seed-Balsamic Dressing. Along with these, I tasted either lovage or celery leaf. Whichever it was, that little bit of astringent greenness made a nice contrast for the richness of the tuna and the sweetness of the balsamic. The tuna itself was a rough chop, more like a rustic tartare than today's omnipresent purées, giving the dish an added dimension of texture. For the second course, I chose Roasted Diver Scallops with Cauliflower-Almond Purée, Wilted Baby Spinach and Hon-shimeji Mushrooms. Wonderfully golden and crisp on the surface, the scallops were rare enough to maintain their bite. In the next slot, I went with European Turbo Rösti Warm Fingerling Potato & Artichoke Salad, Parsley Purée & Caviar Sauce. The Rosti was more a potato crust than the cake I expected. It was a golden brown layer of finely shredded potato on one side of the fillet that seemed to have absorbed a little butter during caramelization, either that or this was the single greatest piece of turbot ever. For the final savory course, the Poularde Baked in Buttermilk with Herbs Spaghetti Squash Gratain, Glazed Baby Turnips with Leeks, Natural Jus with Cranberry &Black Truffle was best suited to the wine we had chosen, so I ordered it. As far as I know there isn't a word for the texture of this meat, though al dente comes to mind. It was soft and moist, yet you felt your teeth cutting it through the whole bite. The total effect was wonderful, the cranberries offering a bit of tang to an otherwise very rich dish. A pre-desert of Honeycrisp Apple Consumé Yogurt Sorbet and Yuzu Cloud was next, and served as a tart break from the savory courses. Passion Fruit-White Chocolate Cheesecake Confit Pineapple and basil Pistachio Ice Cream brought us home. Forgetting that there was a cookie on the plate fashioned into the shape of a straw next to a line of crumbled pistachio, and that for some reason basil-pistachio ice cream tastes uncannily like Jagermeister, this was a great dessert. The highs of the pineapple, and earthiness of the basil, kept the cake from getting too sweet. The Cru team has been doing their thing for a little while now. At a point when most people tend to settle, they seem to keep striving to remain creative. Shea is managing to keep things fresh and interesting, while staying simpatico with Robert's epic wine list. There is nothing better than having eaten the tartare and later in the meal smelling the chardonnay and realizing that the nameless herby lettuce leaf smell I have found in some chardonnays and Alsatian white varietals is actually shiso. The boundless directive of Cru lets this magnificent tiny little flower out of its fine Japanese bonds to play among the wines of the world. Where else could we have spent an evening devoted to celebrating fine pairings? I think it's interesting that you find the ambience of Cru "old boy." My impression was that it was a little plain. I did enjoy the space between tables.) I think the atmosphere in the fonr room is a lot cooler, although I've never dined in that area. "I am aware there are people out there that view the ambiance of Cru as Old Boy and thus find it a little off-putting, but that has never been my feeling." is what i said wich would mean people have said this to me "but that has never been my feeling"
Ah, my apologies, I misread. I find it interesting that anyone would feel it is "Old Boy."